Everyday he draws... and draws... carefully developing characters for his own works, which are released almost daily on his Instagram page (@jf4draws). He is young, smart, focused and determined, which will take him far in the creative business. Gary has watched his young nephew, James Fairbanks IV, progress from barely being able to draw, to the stylistic cartoon artist he has become today. J.J. (as the family calls him), is truly on the brink. A Storyboard Artist; his drawings will mix right into the lighthearted vision Gary has for a lyric video that will be produced for the "Soul Survivor" CD scheduled for release sometime next month. In addition, our website and social media pages will likely include other works by James as time goes on. 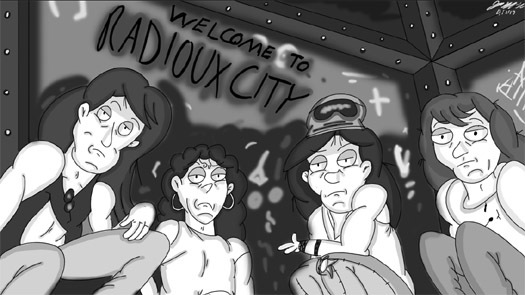 A true music fanatic - this job lands right in James' wheelhouse... and Radioux City will be a much better place for it. Thanks J.J.!